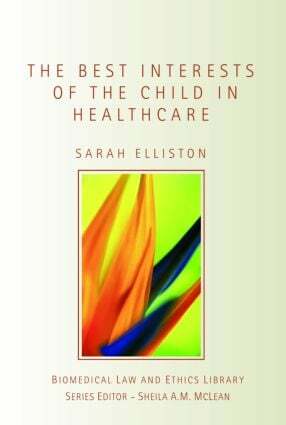 Topical and compelling, this volume provides an excellent re-evaluation of the ‘best interests’ test in the healthcare arena; the ways in which it has developed, the inherent difficulties in its use and its interpretation in legal cases concerning the medical care of children. Comprehensively covering both the English and Scottish position within the context of the European Convention of human Rights and the UN Convention on the Rights of the Child, the author examines a wide range of healthcare situations, from the commonly occurring to the unusual, offering a detailed analysis of legislation, case law, cases and their implications. the response to situations where the interests of children may be in conflict – the cases of conjoined twins or the donation of organs to siblings. This work is a key resource for postgraduates and researchers working and studying in the fields of law, healthcare and medicine.